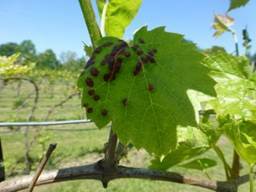 One of the great things about growing grapes in Vermont is that, by and large (and compared to my other crop, apples), the pest management is relatively simple- four or so well-timed fungicides sprays, and an insecticide aimed at grape berry moth. There are other considerations for unique situations: wet years or susceptible cultivars that need an extra botrytis spray; Japanese beetle or phylloxera on young vines. And then there’s the potentially weird, and maybe damaging, like grape tumid gall maker (GTGM). This insect is similar to phylloxera in that the larvae feeds on leaf tissue which responds by forming a protective gall around it. GTGM is different in that it also affects rachises and fruit, and when the galls become fully engorged, can look pretty dramatic. Figure 1. 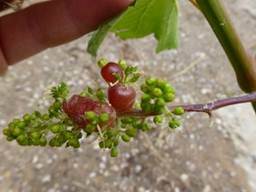 Grape tumid gall on a fruit cluster in midsummer. UVM vineyard, 2009. GTGM is an midge insect (small fly) that lays eggs on grapevines. Flies are ephemeral and only live a day or so; management should not be targeted at adults. Hatching larvae burrow into vine tissue and are thus protected from contact insecticides. In most vineyards, GTGM is considered a minor pest or even a curiosity as the galls can be quite drastic-looking. That said, I have been hearing reports of high levels of GTGM in vineyard this year, and some of these vineyards reported them last year under different management, so I suspect that certain vineyards have increasing and potentially problematic populations. Figure 2. GTGM on Marquette, UVM vineyard, 2010.. Vineyards should be scouted before assuming you have a problem with this pest. There is no threshold established, as most growers tolerate low levels of damage. However, I have heard reports of 50% or more leaves affected in some vineyards, and I can’t imagine how that wouldn’t negatively affect vine productivity. Figure 3. GTGM on inflorescence. UVM vineyard, 2011. Sanitation is an important method of reducing GTGM populations and may be enough in low-pressure situations. Galls can be crushed if seen on leaves, or severely affected leaves removed and destroyed. In organic vineyards, as always, this should be the first line of defense since spray options are minimal. If the extent of damage is beyond physical removal, an application of Movento is the best (only) recommended option I can find. Movento is a systemic insecticide with a unique mode of action and is listed as posing low risk to wildlife, and as non-toxic to fish and birds. It is best used at first sign of galls, practically speaking, as scouting for hatching larvae (which hatch from microscopic eggs) is difficult under normal field conditions. GTGM may be distinguished from phylloxera by the gall surface, which is smooth compared to phylloxera which is bumpy or warty. 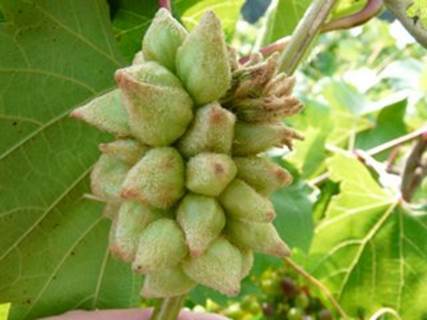 Movento is effective against phylloxera as well as GTGM and has a long residual control period, so may be a good material if either or both of those pests are common in your vineyard. This entry was posted on Thursday, June 8th, 2017 at 1:35 pm and is filed under Grape, IPM. You can follow any responses to this entry through the RSS 2.0 feed. Responses are currently closed, but you can trackback from your own site.